The treacherous trek to Isola continues for Captain Rook and the Queen. Supplies are low and the Queen is weak. Rook makes the decision to venture into an abandoned city while leaving the tiger Queen behind to rest. It's a decision that could prove costly. 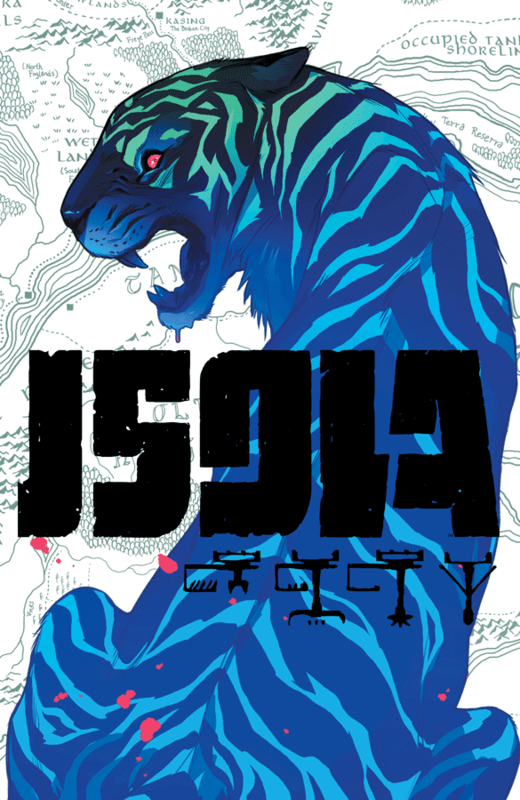 Were it not for the gorgeous art in this series, 'Isola' would seem like a very slow developing fantasy with little plot development and answers. But Karl Kerschl's designs are wondrous and Msassyk's deep rich colors are every bit the Studio Ghibli-inspiration they claim it to be. And the art does tell the story, as well as Kerschl's and Brenden Fletcher's script, does. It's just a leisurely stroll through some dangerous terrain where anything can happen. Rook's supply run has her crossing paths with some unexpected figures. The build-up to these moments can lull the reader into a false sense of security so for the book's intentional slow pacing, the second half is an exhilarating experience with a great cliffhanger. It's an undeniable slow burn but everything is rendered so beautifully you won't mind examining every inch of the page. As lovely as 'Isola' is, it could use some revelations to provide more backstory and answer some lingering questions. We don't know the how or why yet and we're being introduced to new characters leading to more questions but it's never dull. Every panel could be confused for an animation gel making this series look absolutely peerless. The next issue could be the make-it-or-break-it point for this still-evolving story but it's still a recommended buy.